Exploring in the Mud-Brick city of Yazd in one day! Yazd, located between the Dasht-e Kavir and the Dasht-e Lut deserts, is one of the oldest cities in the world. It is known for the wind towers, or badgirs, built on its houses and for the beautiful weavings created by its craftspeople. Yazd is also the original home of the Zoroastrian religion. Zoroastrians believe in an all-powerful god called Ahura Mazda. Ahura Mazda is represented by fire, which Zoroastrians believe he created. A holy fire enclosed in the Zoroastrian temple in Yazd is believed to have burned continuously since 470 B.C. It is tended by temple priests and protected from the public by glass. During our Yazd day tour you’ll see some of the most important sites with a Yazdi local with a wide knowledge about Yazd city. We will start Yazd day tour by visiting the Zoroastrian Fire Temple and see a flame that is said to have been burning for the past 1,500 years. It’s an important pilgrimage site for the faithful and here our expert guide will offer additional insight into one of the world’s oldest monotheistic religions. Next up your Yazd day tour is to visit Amir Chakhmaq Square, Here you’ll see a very impressive Hussainiya – a congregation hall for Shia commemoration ceremonies. With three tiers of recessed alcoves, all perfectly proportioned, its façade is one of the city’s most photographed landmarks. Then visit the Friday Mosque, built in 1324, where you can gaze upon the tallest minarets in the country. Today you’ll enjoy lunch during your Yazd day tour at a local restaurant we’ve selected for its delicious Persian cuisine and friendly ambience. The Iranian people are gregarious by nature and some of your fellow diners, once they hear you speaking English, may ask where you’re from! 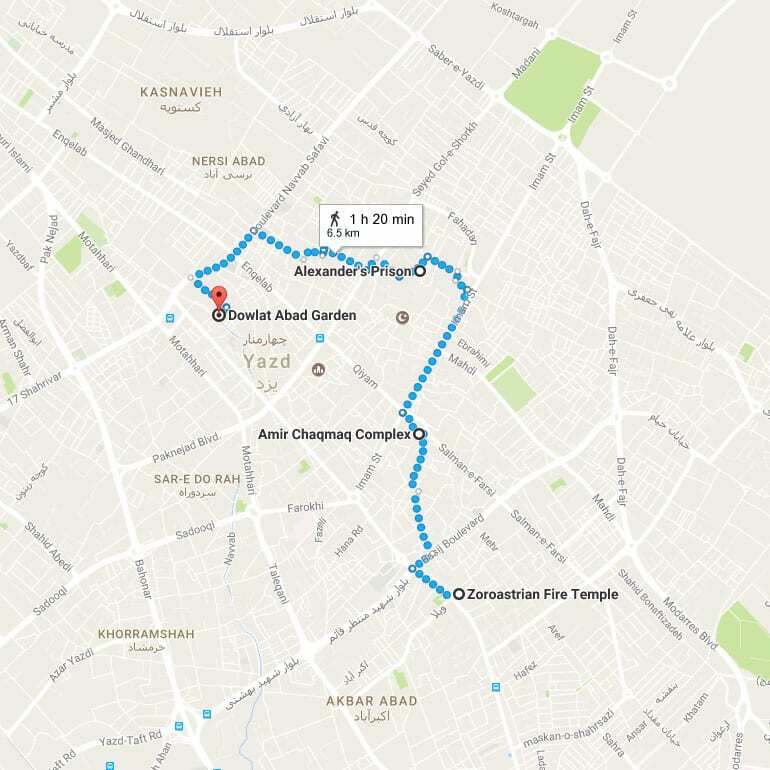 At the end of our Yazd day tour, we will drop you off at your hotel OR city centre (Whichever is convenient to you). Airport transfers are not included for city tours. Our sightseeing tour does not include entry ticket to monuments and museums, tips, food, personal expenses etc. If you would like to book this tour, please complete the online reservation form on our website. We will then contact you with more details about how to complete your booking. Payments may be made in cash on delivery to our tour guide rather than in advance.